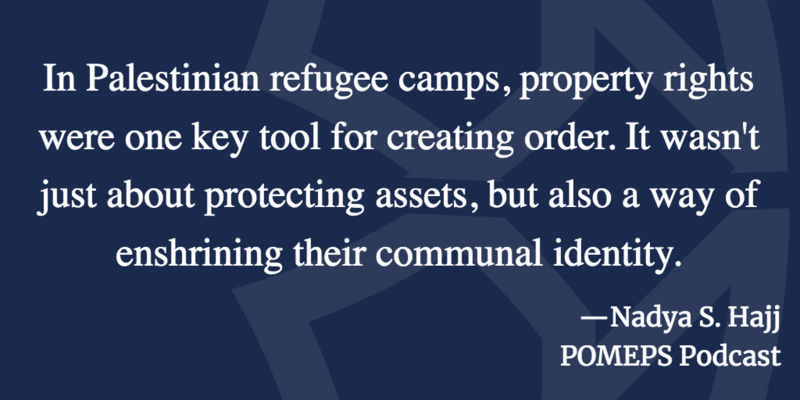 This week’s podcast explores Palestinian refugees today, with guest Nadya S. Hajj, author of Protection Amid Chaos: The Creation of Property Rights in Palestinian Refugee Camps. “I started visiting [Palestinian refugee] camps in 2004. The camps looked really different than these impermanent types of places— and people were doing much more than surviving. They were actually thriving. Physically you could see this: over time, their homes had become more permanent structures. There were businesses. There were paved roads. There was a real estate market. There was a lot of entrepreneurship going on. And institutional literature and economics literature didn’t really explain why would people do that if they knew they were in a refugee camp. Why would someone invest in the world around them?” said Hajj, assistant professor of political science at Wellesley College.